IBM AIX provides many options for software storage configuration and allows you to tune your I/O performance and system availability using striping, mirroring, specific disk placement, etc. After a full-system failure, recovering an AIX server to its previous configuration, even when using mksysb, can become a difficult and time-consuming task. Add a change in disk or system hardware to the process and you may experience days of downtime and lost revenues. SBAdmin provides flexible recovery of rootvg and data volume groups to dissimilar hardware and storage. The AIX mksysb utility has been around for a long time and works fairly well. But, it is just a command-line utility and not a full-featured backup product. 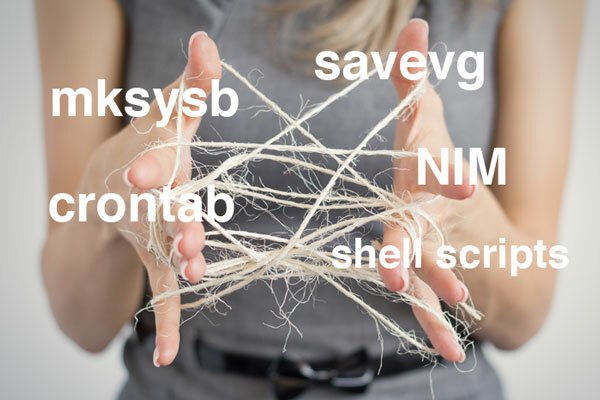 Relying on mksysb requires systems administrators to write their own scripts to copy the mksysb images to storage, keep track of cron entries, and configure a separate NIM server to host the images. Plus, you still have to run the savevg command separately since mksysb only backs up rootvg. Why not let the backup software handle all of that for you and a lot more? With SBAdmin, we take care of backup retention, scheduling, coping off backups, reporting, notifications, and you no longer need to use NIM for system recovery. You can also choose to back up the entire system (or just rootvg) as part of the backup job.